Is the Internet 9/11 Under Way? Think about it. Where is this seemingly staged Wikileaks furor taking us? While we participate in digging into the juicy tidbits of information that incriminate just about anybody and everybody, where is it all going? While 9/11 served as a wake up call to those awake and aware enough to see the obvious demolitions and misinformation and resultant "Pearl Harbor" effect, most of the world fell for it. And now people are literally bending over, as in airport 'screenings', to the onslaught of police state fascism worldwide. It's staggering. In fact, it's Orwellian. The armies, police and private sector are at war with the vague concept of terrorism - an unbeatable enemy in a war that can be drawn out indefinitely and fought in any arena necessary. And what was the result of this declared war on terrorism? Not a war on terror, but an increase in fear and terror, all to justify the economic, social and political clampdown that has followed. What will the Wikileaks debacle herald? You guessed it--the last bastion of freedom of information and expression, a free Internet, will topple. After all, if information is now the enemy, we must carefully police any and every aspect of this dangerous medium--all for the safety and protection of 'we the people'. Oh, we'll still have the Internet, just like you can still fly. You'll just have to be on the "approved" list, screened, stamped, zapped, mugged and molested if you want to get "on the net". No biggie. Thanks Julian--job well done. #1. Wikileaks---WAY too approved and publicized. Every TV and cable network, press worldwide, official recognition from every level of government. Heck, he even does a TED talk! Where's anyone else trying to expose the agenda? Only Julian. Hmmm. #2. Biggie: This supposed system fighter says the 9/11 truth issue is a distraction, of all things. Mustn't step on your bosses' toes now, should we Julian.. Very suspicious if you ask me. Also, Assange reportedly wrote for both the New York Times and the Economist which is fishy as well--not a real enlightened or 'alternative' mindset. His mysterious persona also plays well to the Wikileaks furtive image so people won't expect to know too much, which also is very 'convenient' for keeping anything hidden. NOTE: There doesn't have to be deliberate, conscious involvement in some agenda on Wikileaks' part, but it helps. He, they, could be 'useful idiots' whose program has been conveniently co-opted by the controllers to serve their purpose. Either way, look for the pattern and the effects. WikiLeaks is also under attack by notorious hackers, while its services are being cut-off by Amazon and EveryDNS.net. Although not officially announced, Julian Assange might be considered today's public enemy number-one, taking the place of the illusive Osama bin Laden. Not since 9/11 has any one figure reached such notoriety due to what many consider acts against a state. Like bin Laden, Assange has no permanent address, does not maintain a headquarters, employs only a select few confidants and has taken to hiding in covert areas. Younger than bin Laden, Assange at 39 years-old may be a little more mobile than the 53 year-old, choosing to hopscotch the globe versus hibernating in the mountains of Pakistan and Afghanistan. While his face resides on the covers of magazines and newspapers around the world, similar to a Wild West 'Wanted' poster, little is known about his day-to-day activities. Like bin Laden's video addresses, while the CIA and other mercenaries are seeking his where-a-bouts, it's amazing that he still finds ways to release updates justifying his actions. Notice also how we've been hearing about Wikileaks' exploits for a few years now, giving us time to make the connection between it and sensational and 'destructive informational terrorism'. Similarly we heard about Osama through the Yemen and Nairobi attacks being attibuted to him, imprinting his "brand" on the collective mind which led to the foregone phony conclusion that he had masterminded the 9/11 attacks. Could all these serious indictments against their own just be a deflecting smokescreen to hide the real purpose? Sure worked last time. So why wouldn't they risk taking down some of their own to give this psychological operation credibility? 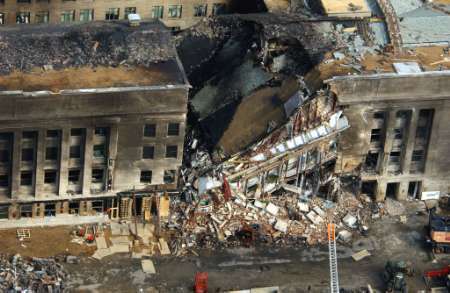 Pentagon strikes 'its own' on 9/11---need I say more? First there's the Hegelian Dialectic - create a problem, provoke a reaction and then implement the pre-planned solution. The staged 9/11 attacks, including the internationally inhabited World Trade Center, 'justified' the ensuing wars and worldwide clampdown on freedoms in the name of 'security', including the horrendous Patriot Act that was already written and just waiting for an excuse to be signed and implemented. Similarly, this attack over the international Internet and drawing in diplomatic communities worldwide by exposing state secrets from a variety of countries will greatly help usher in international measures in the name of 'security', probably spearheaded once again by the fascist US government with coinciding EU, Canadian & Australian measures. It's already under way with the Department of Homeland Security confiscating websites. All they need is 'the right incident" to justify bringing on full control. Like "Internet Terrorism"? They just can't use that term enough now, can they. After all, it's a war on terror, and "if you're not for us, you're for the terrorists." The ultimate false choice, just like everything else they foist on the human consciousness. Pretty clever these ol' boys. It's in their blood. Those manipulating world events belong to a cult, a brotherhood that hides behind many names and guises, and to which they pledge their absolute loyalty above everything, even their own flesh and blood. Commonly referred to as the Illuminati, this cult has an agenda they work to fulfill using certain rituals, methods and tactics. One of their central themes and modus operandi is "Ordo Ab Chao"-- order out of chaos. Create the chaos, pitting anyone against anyone while controlling and fomenting both sides--hence the double headed red phoenix symbol-- for any reason, even killing or exposing their own, to create an illogical madness that they think only they can see through and understand. All the while they are manipulating world governments, banks, armies and corporate leaders and drawing the net on the outcome they have already planned. Fear and confusion is the climate they love to foment. As long as there's a confused and uninformed populace, the ignorant and fearful masses will be crying out for help from the 'powers that be' - the very "powers that be" that caused all the problems in the first place. They're not out to help, they're out to control. At any cost, by any means necessary. Article kindly supplied by Before Its News. You can find the original article here. Comments for Is the Internet 9/11 Under Way? It is ridiculous but the more social media people have nowadays, the less social they become. People are simply lazy and do not want to communicate. However, sometimes social media are very useful, because one can find find there a great deal of helpful information. You can also check this great source www.academic-writings.com if you are looking for high-quality and original custom papers on any topic. Oh, dear. It's terrible. A lot of people's lives were ruined because of this. I will be fresh with school creating companies and also I will be uncertain just what to find. My partner and i observed essaygeek service and also considered they will seemed authentic therefore i feel questioning easily are able to use their particular companies. Just what you think with this? Very interesting and informative article it is. Nowadays people are addicting with Internet. Everything has positive and negative effects. So It also has many negative effects. Anyway, I have learnt lots of new things from your article and Inspiring you to write more like this one. I think http://www.dissertationworld.biz/ this site will help you more to write more contents. Get free wealth related coaches and updates and also read more about 9/11 issue as well. That post indicates some important issues. Our college essays writing services are now achieving their goals in short period of time. That's really a great sign for everyone.